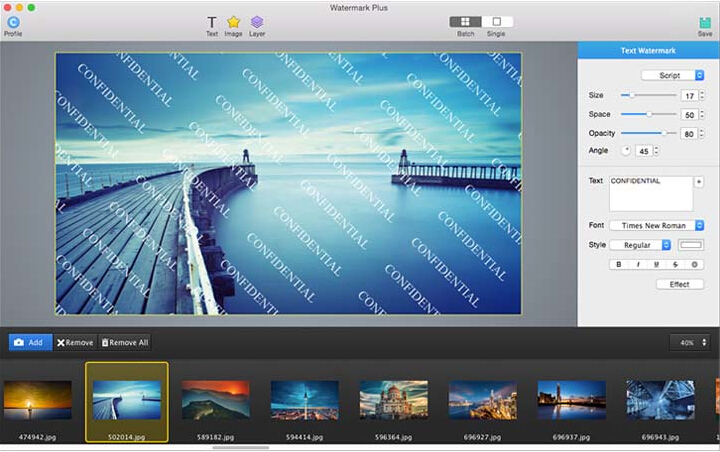 Watermark Plus is an easy and intuitive bulk photo converter that lets you add text/image watermarks, resize and rename a bunch of photos at a time. It's the most effective way to protect photo copyright from unauthorized using. It lets you add text, image, script, symbol or other info stamps to multiple photos, and it will auto-adjust your watermark for each photo to best fit its size. Watermark Plus is an easy and intuitive bulk photo converter that lets you add text/image watermarks, resize and rename a bunch of photos at a time. It's the most effective way to protect photo copyright from unauthorized using. It lets you add text, image, script, symbol or other info stamps to multiple photos, and it will auto-adjust your watermark for each photo to best fit its size. You are free to choose any one of the 17 built-in profiles as watermark or save your own commonly used watermark for repeated use. What's even better is that every step of the process can be previewed in real time with high speed.